While at college and working in retail, Lansana Camara decided to commit to a new career path. Extensive experience with computer games at a young age had led Lansana toward an avid interest in technology. But it wasn’t till this point that he realized the only way he was going to find true joy in his work was to combine two of his passions: technology and helping others. 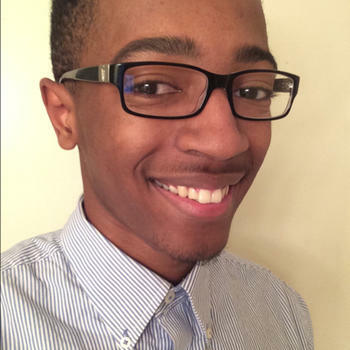 With zero coding experience, Lansana signed up for Treehouse and began learning to code in his free time. Fast forward six months and Lansana is now a full-time Software Engineer at an exciting tech startup. We asked Lansana to share more about how his career has evolved and his plans for the future. The value of Treehouse, in my opinion, is something that simply can’t be taught with formal education. It taught me how to teach myself. A skill like that is priceless. I was first drawn to the web industry back when I was in the tenth grade in high school. At that point, I had been almost a decade into a game I was majorly addicted to, namely Runescape. Runescape taught me a lot about computers in general, ranging from learning how to hack user accounts and how to monetize something (I am not too proud of the former, but it did happen). The reason tenth grade was unique is because I learned how I could sell my in-game items for real life money. That year, at 16 years old, I made around $10,000 from online gaming. From that point on I had a really big interest in the web because I saw the opportunities it could bring people. After working numerous retail jobs and deciding that I couldn’t live the rest of my life under the command of people who didn’t care much for me, I started looking for ways to “create my own path”, if you will. After a lot of reading and researching, I concluded that the only thing that I could find true joy in every single day of my life is technology and helping others. So that’s the path I took. I stumbled across Treehouse on a YouTube ad when I was watching MIT Comp Sci lectures (just for fun), but ignored my gut telling me to click on it the first few times. After a while, the ads kept coming up and I thought “why not?” and clicked. That click paved the way for everything that I am today. The value of Treehouse, in my opinion, is something that simply can’t be taught with formal education. It taught me how to teach myself. A skill like that is priceless. My advice to students just starting out is to get out a dictionary and look up the word “grit” – you’ll need it. Once you have that, everything else falls into place. I have many plans for the future. I work out five times a week and want to take my fitness and strength to a level that will allow me to inspire and help others get into shape. I’m also in a program mentored by Terrence Yang, Founder and CEO of Yang Ventures. I came to him with a startup idea a few months ago and he’s been helping me since. While doing that, I am working on building a self-improvement platform in my free time. I have a dream that one day people who are stuck in the hole I was in a couple of years ago will be able to use it to find the greatness within themselves. That’s what I really work towards every day.